Penny and I recently watched a three-part documentary about London’s most luxurious and expensive hotel, Claridges. It’s a fascinating look behind the scenes of this centuries-old establishment, and its ceaseless quest for perfection in hospitality. In the first episode, Claridges General Manager, Thomas Kochs, said that his objective is to, “Create at least one memory that will turn into another visit.” Penny and I looked at each other when that was said and nodded in agreement. 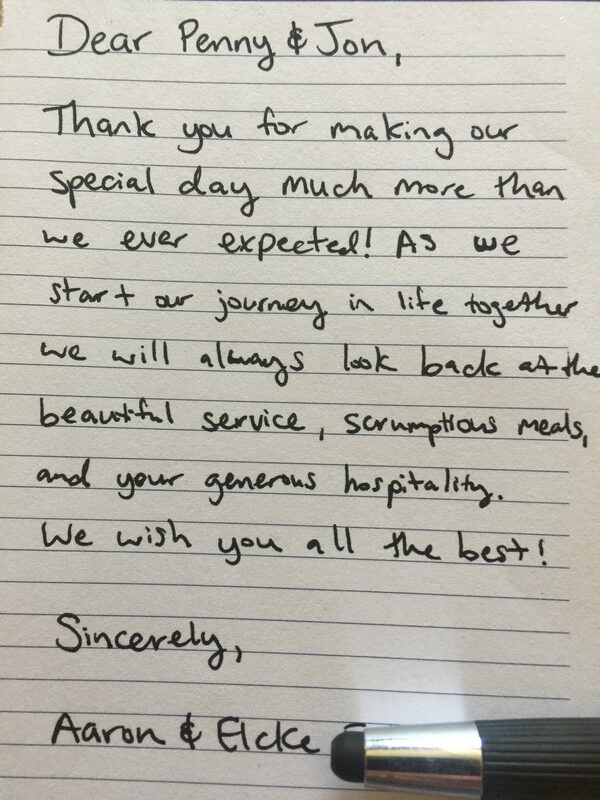 It was a simple and perfect summation of our objectives as innkeepers and hospitality professionals. In short: This is what we do. This past weekend was great. The Old Caledonian was full of wonderful guests from all around the country, we had an elopement, and we had a late reservation; all of which provided us opportunities to create just the kind of memories that Mr. Kochs was talking about in that documentary. We really love elopements here at the Old Caledonian. We have a package that includes a bouquet, boutonniere, dinner, a wedding cake for two, a bottle of champagne, bubble bath, and I even a perform a private ceremony for our wedding couple. It’s a lot of fun, very personal, and our couples just love it. This past weekend’s couple were so emotional, over the moon with joy, and so totally in love we all got swept up in the moment. The ceremony was full of happy tears. They said the dinner was perfect, and that their wedding night room was everything they wanted. They left soon after breakfast and were still glowing as they walked out the door. Penny and I felt so happy for them. We chatted about how it is so satisfying for us to see our guests so completely satisfied. Later that day we had a late reservation that requested dinner for that night for a husband and wife. Although we normally request that our guests give us 48 hours’ notice for adding dinner, I had items on hand that I knew would make for a fine meal. So, I said yes. After they checked in, as I was giving them the tour of the house, I mentioned Caledonia’s Scottish founders. The husband mentioned how much he loved visiting Scotland, and that he ate sticky toffee pudding in nearly every town during his visit. He loved it, he said. I began to think what I had in the kitchen and realized that I had all the ingredients for sticky toffee pudding on hand, even the dates by sheer coincidence. So, I showed them to their room, then served them our famous teatime, and proceeded to prepare sticky toffee pudding just two and a half hours before dinner. I could not wait to put that dessert down in front of them. The whole rest of the dinner prior to dessert I couldn’t stop thinking about what their reaction might be. I was so excited. When I finally brought out the pudding and put it in front of them, they were ecstatic. And I was thrilled. They absolutely loved it and were so happy I was able to do this for them. They said they would always remember it. Creating memories. This is what we do. What will be your memory be of the Old Caledonian Bed & Breakfast? The sous vide lamb for our anniversary dinner one year ago today was awesome. But the best memory was your own stories Jon. We need to get you to Huzzah. I will call! !